Offering you a complete choice of products which include aluminum profile connector fish type and single arm lcd wall mount bracket. Being an eminent name in manufacturing and supplying, we are engaged in offering Aluminum Profile Connector Fish Type. Offered range is precisely manufactured using fine quality raw material, procured from the certified vendors of the market coupling it with the latest machines. Each product is tested on well-defined parameters of quality under the guidance of our quality controllers to eradicate flaws. This product is widely recognized for unique features given below. 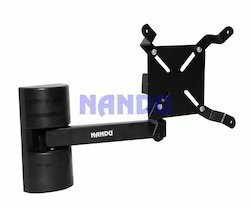 Our vast industrial excellence has enabled us to manufacture highly reliable LCD Wall Mount Bracket Single Arm. We present the universal size wall mount bracket that easily accommodates all sizes of flat panel LCD, LED and Plasma TVs. Its unique design makes it suitable for all kinds of ambience at hotels, offices and homes. Developed from robust quality raw material the highly durable wall mount bracket can be ordered from us at a competitive price.